The Strollers community theater presents Doubt, A Parable, the award-winning drama by John Patrick Shanley, performed in March at the Burgdorff Center for Performing Arts, Maplewood NJ. As relevant today as ever, Doubt delves into the murky shadows of moral certainty, challenging each of us to separate perception from reality. 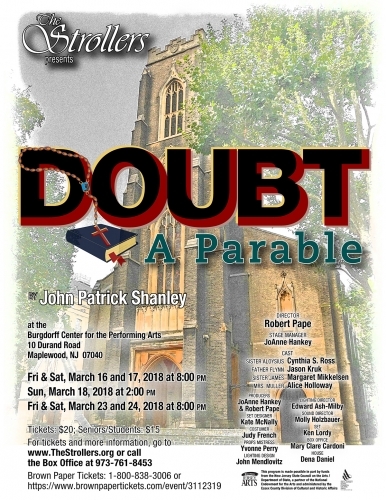 Set in 1964, just after Vatican II, Doubt takes us within the halls of a Catholic school and tells the story of a suspicion. The strident Sister Aloysius, both head of the school and subordinate of the newly arrived Father Flynn – her junior in both years and experience, is determined to protect the children in her charge as well as her own position in a new power struggle now in play. When her attention is drawn to Father Flynn’s interest in one particular student, Sister Aloysius must investigate, drawing in novice Sister James and the boy’s mother. Each with motives of their own, the players in this tense drama are forced to weigh the value of truth against the burden of consequence. But does truth have any weight at all when it is shrouded in doubt?